Loved this saddle. It was awesome to look at. Unfortunately it didn't fit the horse and was too large for the rider. It was returned for a full refund. State line handled this with consideration and speed. Great saddle. Fits well. Nice leather. Nice and comfortable. It is very big for its size. I should have gotten the smaller size in the Australian size. Iâ? ?m a 16â?? seat and I git the larger Australian saddle. It is NOT light weight. I thought it would be lighter than my other saddle. Itâ? ?s not. But thatâ? ?s not a deal breaker for me. Iâ? ?m ok with that as long as itâ? ?s a comfortable ride all day on the trails. Which it is. This saddle is very comfortable for my 14.2 gaited horse and myself even after hours at work or on a trail with friends. The leather seems to be of good quality although the dye does come off in a couple pressure areas. The seat and bucking rolls does not seem to be leather. I was able to use my old breast collar, matching the saddle with dark brown dye and by attaching D-savers to the English forward brackets. This saddle is a great fit for my short backed horse as the shorter skirting prevents saddle sores on her rear hips, this saddle fits well in the shoulders making room for a gaited horse to stretch out and the saddle has a comfort channel all the way down the spine with thick soft padding running along both sides. I purchased this saddle for my most trusted working partner because I had noticed at age 18 she needed a lighter saddle and one that would give spine pressure relief. With the addition of stirrup turners even this senior cowgirl can ride for miles in the saddle with complete comfort. Now, I must say that only time will tell how rugged this saddle really is. I ordered the 17 " seat, it was the smallest offered. The saddle looked as pictured but the seat was a little big. The leather was VERY stiff, looked painted. My biggest complaint is that the stirrups were too long and there was no way to shorten them without cutting away leather. For me the saddle was unusable but they made me pay return shipping anyway. I've purchased from State Line before with no problem, but this saddle had to be returned to JT International..at my expense. i was really excited to get the saddle to my house but when i went to try on my quarter horse it was too tight for his big shoulders and high withers. tried other pads but nothing helped the fit .for my horse. read the write up and it said it would fit high withers and quarter horses. i bought saddle due to comfort for trail rides in write up but didnt work for my horse. Fits well for me and 16hh Quarter/Arab. I've had this saddle for almost a year now and use the saddle about once a week. For trail rides it works great. Nothing has broken and the leather is holding up very well. The only things I did not like were the stirrups are hard on your knees after a really long trail ride because they tork them when going at a trot or canter. The saddle is also a little slippery for the rider because the top of the saddle is too smooth. But, it works well for the type of riding I do. The saddle also looks really nice with the cute floral pattern! I bought this saddle a while back and I love it. I can ride for hours and not get sore. Fits my mare better than my western saddle. You get what you pay for!!! How true! Especially in this case. The saddle was so poorly made. There were bumps under the leather on the cantle that were hard to describe. The tree sat on my horses back like a camel saddle would.....very high. So many aspects about this poor saddle are too numerous to describe. Buyer beware! I sent it baaaack! I thought that I loved this saddle but after 4 rides the cinch rigging broke! It cost me $28 to send it back and it took 3 weeks to receive my money back and then they shorted me $20! I do NOT recommend this saddle. The leather seemed cheap and plastic like on the seat. I love this saddle! I use it for trail riding and contest sports and it works well and is comfortable. I wish I would've bought the smaller size though. Fits the horse, fits me, but the quality of the leather is so poor that I almost hesitate to call it leather. The finish looks like it is painted on.If you try to oil the saddle and fenders to soften them up. The oil will not go through the dye/"paint" I had to oil the fenders from the underside. If this saddle was made of better leather I would give it very high marks. However, if I had realized how bad the leather and finish were I would not have kept it. I suppose I am stuck with it now. Hopefully it will soften over time, because I do love the fit and comfort. Very secure seat! This si a good saddle but is too large for my small short backed arabian. I liked it but had to return in way too big for her short back. I paid to send it back 3-18-2014 and still have not gotten my credit for it on my card. HI THIS SADDLE YOU LIKE THE ONE FOR ME! HOW MUCH WOULD IT COST SHIPPING TO SCOTLAND PLZ, AND HOW MUCH TOATAL WOULD BE ? I was looking for a fairly cheap trail saddle and I love that this has the western rigging but the Australian seat. I wanted something that stay put like a western saddle but I ride mainly english so the Aussie seat is more similar to what I'm used to. My horse has very high withers and this saddle fits both of us very well. The overall reviews were pretty good. I have a horse that doesn't like a western saddle and I don't always want to ride english. I also want a saddle that both my husband and I can fit into. This looks like it will fit the bill. I have one and my sister wanted one. Looking for a saddle that you could ride for many hours without being sore and tired from the ride. But wanted the western fenders and girth that I likeon my saddles. Hope this one will be the last saddle because it is so comfortable for me and my missouri fox trotter and paso fino. Trying new saddle for a hard to fit horse. This saddle didn't fit me but did fit the horse. Seat was too large. Looks like a good value. Wanted one with no horn but it is not available. need larger gullet and deep seat. price was a good value, product reviews were key as well as price for purchase. Our first horse is a quarter horse with high withers. We've tried full 1/4 and semi 1/4 and a professional has recommended an Australian. Have my fingers crossed. Many other websites have this exact same saddle listed as Full QH Bars with an 8" gullet. Here it is listed as Semi QH Bars and a 6" gullet. Which is it? BEST ANSWER: i have one, the gullet is wide - about 8"
I would love to buy this saddle,but would it fit an Arabian? she has a short back and narrow withers.My Kimberly stock saddle seems to fit her,but this saddle has a western look with the aussie features! So has anyone seen this saddle fit a little arab? BEST ANSWER: I bought this saddle for my Arabian mare who is extremely difficult to fit because she has a short back and is very barrel shaped. This is the first saddle that has seems to fit her well and that she seems to be comfortable with. It has a wide gullet area - about 7.5-8" which is what she needed. She does not have prominent withers. However, we have not had a chance to ride extensively with it yet, that's why I have not written an official review for Stateline Tack. The smallest size - the 17" is equivalent to about 16" western. I am a small person, 5'2" and 112 lbs. so it is larger than I would like it, but not large enough to send it back. I had to have the fenders shortened by a saddle guy. I love the saddle and hope that I will love it and my mare will too on long rides. Hope this helps. I bought this for my short backed Arabian mare and the length is fine. Gullet is wide though and fits my very round, barrel shaped girl. The weight is actually about 30 lbs, it is not marked correctly. I like the saddle but have not spent much time in it yet. It seems to fit her well. My brother in law purchased this and he has two arabians. He seems to really like it. This saddle is too wide for my Arabian but fits my broader Fox Trotters. I normaly take a size 15 in a western saddle and this saddle only comes in 17 or 18 why is that it does not come in smaller sizes? BEST ANSWER: Hi Lynn, I am like you, and would take a 15, and some saddles a 14. I went a head and purchased the 17 because it is supposed to be the same as American Western 15. I love this saddle, and am so happy with it. Yes, I have a little extra room, but I'm fine with it. I am so pleased I purchesed it for my Tennesee Walker. Hopefully you'll feel the same! Hi, I wish it came in smaller sizes too. I normally take a 15 in western and went for the 17 since that was the smallest offered. I put a seat saver on it to take up some of the room and it is still a little big. But it fits my very hard to fit horse so I like it. it's a comfortable saddle and I'm able to use it like any other western saddle and it's fine. You just don't really have the poley advantage the way it was intended when the seat is a little too large. I normally ride in a 15 or a 16 also- but due to the angles of the aussie saddles, a 17inch seat size feels like a smaller size. I'm guessing unless you are extremely petite, you would feel fine in a 17. On English and Australian saddles your sizes are labled two sizes bigger than your western. So a 15 western would be a 17 English or Australian. I am 5'3". Are the stirrups adjustable, or would this saddle fit me as is? I have this saddle and it is totally adjustable.. I think that the original length 'as is' would fit someone 5'3. I'm 5'7 and it was a little short for me so I feel that you should be good with the length they are but you can adjust them easily. Hi Rod, Kim and Jennifer - Thanks so much! I have a new quarter horse, and from all else I read, this sounds like it would be a fit for him, just wanted to be sure I could adjust the stirrups - you answers helps me so much! I have been looking for a 7" gullet, FQHB saddle, but from other comments, it seems this one will work due to its 8" gullet. If you have (or anyone else has) any additional comments, they are welcome. I love the looks of this saddle, and need something light weight to lift. I weigh more than you do, Kim, and would need a sz. 16 western saddle. Thanks again everyone! I am 5' 4" and couldn't make the stirrups go short enough for me. It appears adjustable under the flap, like it could be adjusted short enough, but I don't have the strength to pull it through or it's glued. There are enough holes in the leather to adjust shorter, the problem stems from the flaps. I just needed one more inch, so if you have longer legs (mine are short with longer torso), it may be okay. I am 5'2", I had a saddle person professionally shorten the fenders and it came out great. I love it. However, I thought the 17" size was "english" measurement and would equal about a 15/15.5" western. The 17" is like a large 16" western. I am 112 lbs. and the 17" saddle is large for me; there's about 4" between my thigh and the poley. Laura, the weight of this saddle is about 28 lbs., NOT 18! Also,if you need the 16 western, then the 17" aussie should be just right for you. A man would easily fit in this saddle too - my husband is 175. the poleys are suppose to be an inch or so from the thigh in order to give that seat security. Thanks, Kim! I really appreciate your responses to my email - very helpful! Thank you! I just ordered this saddle and am really looking forward to receiving it! The stirrups are adjustable! The saddle is comfortable! if I use a 16.5 western saddle, what size would I need in this saddle? BEST ANSWER: A 17 Australian size is a 15 American western size. This saddle was sized a bit long for me. They have to consider an average rider. A perfect fit for me would require a custom fit saddle and that's just not in my budget at this time. Also, this saddle is as advertised, a "semi quarter horse". I ride in a 16 inch western saddle and bought this Australian saddle in an 18 inch, which I would say is more comparable to a 16 inch western saddle. It feels more snug than my western saddle because of the knee rolls and the horn is set back in further than the horn on a western saddle. It is a nice saddle. Generally riders go up 2" from their western saddle size. Next to the product summary, under Downloadable Resources on the right, click Sizing Information. That may help as well. 18" saddle seat in English and Australian. will this fit a trakehner arabian cross? She is short backed with a narrow wither. BEST ANSWER: My guess is that it would not. It wasn't too wide for my narrow-withered horse, but the bars stick so far forward that they interfere with the movement of the horse's shoulders. This would be even worse on a short-backed horse. It fits my barrel shaped, short backed Arabian Mare where nothing else I tried would. Since it's cut back nicely it has nice wither clearance. My girl is very round. She seems to really like this one. Hope this helps. I have a high withered TB, would this saddle work? I do have a pad with removeable shims but would like to have a good saddle fit and not rely on pad to "fix" it. Does anyone have a picture of this saddle from the front? I'd like to gauge the width. BEST ANSWER: Unfortunately we do not offer a front picture of this item. 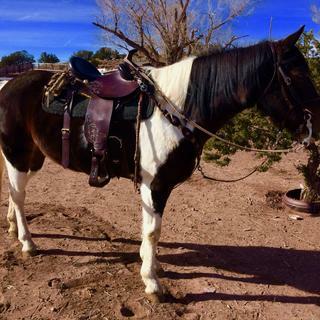 I have a rather stocky round barreled quarter horse paint mare. Would this fit her size? If you use a western saddle with Full Quarter Horse Bars, I would be very hesitant to put this saddle on her because it comes with Semi-Quarter Horse Bars. Other than that, it is a great saddle, very comfortable and very LIGHT. I changed out the girth that came with the saddle to a "roper" girth but that is just my preference. I bought this saddle for my OTTB who has very high withers; however a western saddle with Semi-QH bars does fit him ok so that is why I bought this saddle. I purchased this saddle for a large (tall) and stocky mare who had a short back and high withers. The saddle was an easy fit for her and rode comfortably. Unfortunately, the old mare is now gone and I'm with the saddle. I went with a nicer girth than what was sent. The saddle is durable and lightweight, easy to tack. Its hard to say. It did not fit our very round halflinger mare but it did fit our belgian/ quarter horse gelding who is fat. The mare has no withers and is very round backed, while the gelding has more defined withers and a bit of a top- line at least. I hope this helps. The gullet is 6 inches and it is semi quarter horse bars. I use it for our Morgan's who are narrow at the shoulder and I do use a thick memory foam pad. I love the comfort and security that this type of saddle offers. Other Aussie styles may offer full quarter horse bars. The gullet says 8 inches in the description. Is that not true? The gullet is 8. 6 inches is a typing error. The saddle fits our Morgans perfectly. This saddle did not fit our Saddlebred properly. This particular saddle is semi quarter horse bars, and a narrower gullet. It fits my 15.3 mare with high withers that is built like a Thoroughbred. I have seen this saddle in full quarter horse bars, but this one is probably not wide enough. I have to say that it might not if she is short backed. It sat with the bar on my mare's shoulder. I wound up buying another saddle. My saddle medium tree is too narrow for my stocky mare. I'm trying to sell it. My horse is a TWH mare. She is on the thin side and it fits her perfect. Does this saddle use a regular western girth or an australian girth ? BEST ANSWER: I used a western cinch and worked fine. However, I wouldn't recommend this saddle. Its not a true Australian saddle. its a western saddle with pummels. Highly uncomfortable and pushed you forward. synthetic leather and very cheaply made. Unhappy with my purchase. I use a straight cinch with a roll buckle, and a leather tie strap. Works great and have been doing it for years. Uses a regular western girth...hope this helps. Does this saddle have 2 D Rings or Cinch Rings don't know what you will call it? BEST ANSWER: It has two, they are exactly like a regular western saddle and uses the standard western cinches. I love this saddle, it conforms to your body and you sit firmly and comfortably in the saddle. If you're asking if there's a D on each side of the saddle for standard western cinching - yes it does. There is also the ability to have a rear cinch strap. I appreciate your information but what I was asking is do they have 2 D rings on the cinch side of the saddle. I am aware that there is one on each side. Some of these types of saddles have 2 D rings. I need the ability to cinch further back so it is necessary for it to have 2 please advise. No it does not have the ability to move the cinch. Just 1 D ring. I'm sorry but, I do not have the saddle anymore and I don't remember what it had on it. I do remember that it was a really good lookin saddle - good quality. I have two Standardbred geldings. High withers. Would this be a good fit for Standardbreds? BEST ANSWER: I use this saddle for ny western dressage classes, attractive, very comfortable and puts rider in good position. I use saddle on both of my horses,one is Arabian with wide flat back and other Quarter Horse with high withers fits nicely on both with some wedging for Arabian. Both of these horses I have had only custom made saddles due to not having good luck with over-the-counter saddles in past, so was much relieved that this saddle works for horses and rider. Hi Fara, I don't know if it would. I bought it for my hard-to-fit round, barrel shaped Arabian Mare. She has low withers. This saddle has a nice wide gullet and it cut back and does really well for her. I ave a 14.2 hand mustang. He is quite short backed and my other saddles are too long for him. Would this saddle be a good choice? 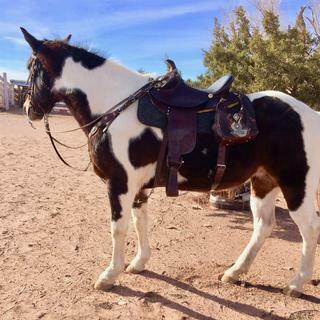 BEST ANSWER: Prior to this saddle I was using my large roping saddle which had caused a saddle sore at the rear skirt area because the skirting was much to large for my spotted saddle horse. The skirting on this saddle is perfect for her, also the light weight and great padding has made my 14.2 gaited horse enjoy our rides so much more. Yes, I have a 14.3 POA appaloosa who is short backed. I love this saddle and have purchased two of them. BEST ANSWER: I've had mine for 2 years and so far ... no, the leather has not softened. It's a good tree fit for my big mare, the knee rolls are great, the leather is nice to look at, however the comfort of the saddle is compromised because the leather is so danged stiff. It wears pretty well - although I admit I've not used mine more than 100 hours over the last 2 years. I ride for pleasure only. Hasnt softened much yet..very comfortable saddle though. All my riders like it. Seems to hold you in the saddle. I am a tall female, 6' and 160 lbs. My horse is a 16.3 Brazilian Warm blood. Would a size 18 work for my and horse and me? BEST ANSWER: This saddle has an 8 inch gullet. I just had a friend at the barn put it on her big frieshian cross worked beautifully hope that helps you. Totally love mine. The saddle width is based on the width of your horse - wither height and how broad across the back. The saddle size, 16 or 17 or 18, etc. is based on your seat size. You sound tall and thin. An 18 may be way too large. Google up how to determine your saddle and seat size. If you ride english, the sizes don't convert to Aussie saddles. For that matter, neither do western seat sizes. There are plenty of websites that tell you how to figure out what size is right for you. I bought the 18- and it was WAY too large for me and I weigh about the same as you, a little more, and am several inches shorter. Does this come in draft size8-10" gullet? size 16 rider seat? BEST ANSWER: the description the add says it has a 8" gullet... Which is correct? This saddle is available with a 6" gullet only. Do you carry this saddle in black? I have seen it in black on other sites. BEST ANSWER: I believe this is the only color in this style, there are other styles of Aussie's. This saddle is extremely comfortable and looks good on both our bay and black Morgan's. Fits well too. We carry this saddle in Dark Oil only. I ride a 16in.western saddle. If I was to ride an Australian type saddle what size saddle would I need? BEST ANSWER: Australian measures 2 inches smaller than western so you would need a 14 inch. Can this saddle fit 2 people.....women 115lbs and a 4 year old? BEST ANSWER: I am same weight as you. Its a really nice saddle but was kind of too large for me. However, I don't think you and a 4 year old would fit too comfortably in it specially with the poleys for your legs.What size were you going to order? I ordered the 17 Inch. Is it sized like a western saddle? BEST ANSWER: Yes, this crossover saddle is sized Western. Do you have black ? BEST ANSWER: This saddle is only available two-toned as shown. I want to order one of these Saddles, but I'm not sure what size to get. I use a 15 to 16 inch western saddle. What size would best fit me? is 17" smallest seat ?, is this saddle "treeless" ? yes or no please ! BEST ANSWER: Available in sizes 17" and 18"
17"= Western 15", English 18"
18"= Western 16", English 19"
Air Tunnel Comfort Tree (special air tunnel keeps your horses back cool for distance riding). do you have similar saddles in " treeless" version ? We do not have similar saddles in a treeless version. The Kimberley company, which also makes Australian tack, has an Ultralight Treeless Saddle (item E005593). You can also check out the Cashel G2 Soft Saddle (E008604). How long does this saddle usually take on shipping? BEST ANSWER: As long as the item is in stock when the order is placed the item should ship within 24-48 hours. 1. How wide is the gullet? I have seen this saddle for sale in 2 places one says it has an 8" the other a 6"? I have a gelding who needs the narrower of the 2. 2. What type of saddle pad would you recommend to go under it? 3. Is it measured like a typical Aussie saddle? Where if you are a 16" western then you will be an 18" in Aussie? BEST ANSWER: Gullet: 6". Any Aussie saddle pad should work with this saddle. You do go up two sizes for the Aussie saddles. Is this considered a close contact saddle? BEST ANSWER: Not really a close contact saddle. Good feel thru the back but not close contact thru the shoulder. Very similar to a regular Aussi saddle.